Practical Sanskrit: भूत - bhUta - beings or ghosts? As you explained bhut…And at the cemetery, you change from is ….to was rather ….has been. And turn to ash. This may get bit confusing since bhut refers to all living beings, but than what burns down is body and not the soul…. The salutation to “shakti-rūpéṇa saṃsthitā” has to me even a deeper meaning as this is just not a philosophy or religion, but also a science. Shakti is the expressed form of Shiva who when unexpressed is symbolized as a BINDU…a formless! 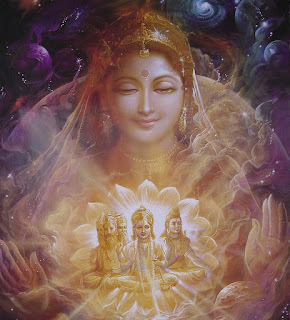 When expressed in the form of SHAKTI the counterpart of SHIVA, the whole universe comes in existence… So SHAKTI is the basis of life and expressed world. We enjoy or experience or observe… etc., etc.…. everything because of Shakti or energy. This shakti or energy in human beings is produces through the metabolism of food we consume. The final steps of energy production takes place in the subcellular organelles called MITOCHONDRIA. In us these organelles are inherited from MOTHER and not father! This is proved in modern biochemistry. So when we celebrate Goddesses Shakti or mother, we celebrate her contribution to our sole existence!!! For all of us every day is Mother’s day. On the other note, Shashikant you seem to be an old timer as you mentioned the movie Bhoot Bangla. This was my favorite when I was in grade four (AROUND 1951).